Historic Nablus is less visited than the southern towns of Bethlehem and Hebron in the Palestinian Territories, but for those who want to explore the West Bank more thoroughly, this town has many tourist attractions to offer. Its history stretches right back to Abraham's arrival in the land of Canaan, and important religious sightseeing sites are scattered throughout the surrounding area. Among the major things to do is Mount Gerizim, with its Samaritan community, while another highlight are the twisty lanes of the old city. Nablus' old city district is a delight to explore. In sharp contrast to the tall office blocks of the surrounding modern districts, the maze of winding lanes and skinny alleyways here are a wonderfully atmospheric place of old and dilapidated stone buildings. In the center of the market area, where you can sample Nablus' many sweets and knafeh (a sweet-cheese dessert) shops, is the El-Nasser Mosque, while the larger El-Kebir Mosque, built in 1168 on the foundations of a Crusader church, is a few hundred meters east. If you're looking for a unique gift to bring home, the old city is home to a thriving olive-oil soap production industry, and several soap factories are tucked within the alleys, where you can watch the process and buy the wares. The extensive remains of Sebastiya (ancient Samaria) lay above the Arab village of the same name. This was the capital of the kingdom of Israel from 880-721 BC, founded by King Omri and his son Ahab, who also did much of the building works at Megiddo. With the conquest of Samaria by the Assyrian king Shalmaneser in 722 BC, the kingdom ceased to exist. 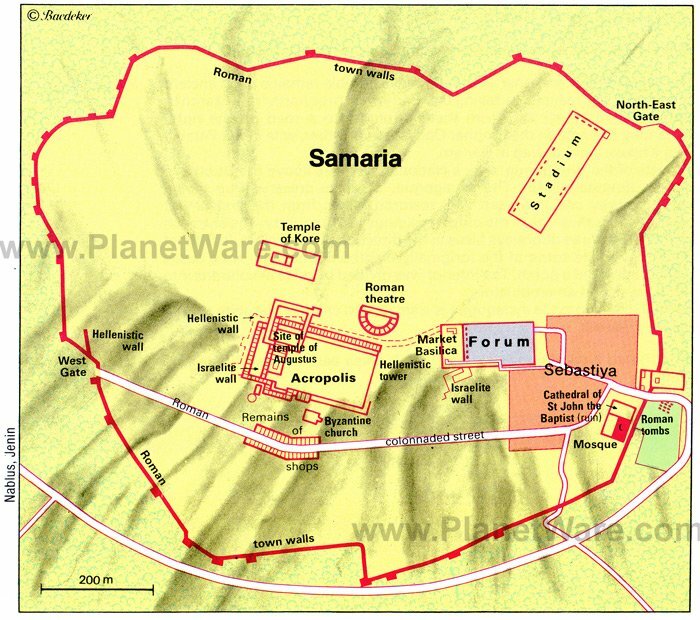 Subsequently Samaria was used as a military base by Assyrians, Babylonians, and Persians. At the end of the 4th century, it was occupied by Macedonians and was Hellenized. Herod brought new splendor to Samaria, rebuilt the town, and renamed it Sebaste in honor of Augustus (in Greek Sebastos). Here, too, he had his wife Mariamne and her two sons put to death. Sebaste's prosperity was short-lived. Jewish rebels set fire to the temple of Augustus, and soon afterwards, in AD 69, Vespasian razed the fortress to the ground. In the Byzantine era, a community grew up in the town under their bishop, and when, in the 5th century, relics of St. John the Baptist were said to be found here, pilgrims began to come to the town. The cult of the saint's relics has continued through the centuries, and they are still revered in the mosque in the modern village of Sebastiya. The ruins are centered around the Forum where, at the western end, a three-aisled basilica from the Byzantine era can still be seen. An ancient street, flanked by columns, leads from the Forum to the well-preserved West Gate. Originally built by King Omri, what you see now is from the later Greek and Roman periods. From the Forum's northwest corner, a path runs up to the Acropolis, trailing past a 9th-8th century BC Israelite well, Hellenistic tower, and Roman theater. A monumental flight of steps leads up to the site where a palace, built by King Omri and his Phoenician wife Jezebel, and later a Herodian temple of Augustus would have sat. No trace of either remains. From the Acropolis, if you walk in an anti-clockwise direction around the site walls, you come to a well-preserved Byzantine church on the south side of the hill where, tradition states, John the Baptist's head was found. Mount Gerizim is home to 250 Samaritans. This tiny religious minority, which sprung from the Jews, who had escaped being deported to Babylon after the fall of the northern kingdom of Israel in 721 BC, can now only be found in the village of Kiryat Luza, on Mount Gerizim's slopes, and in Holon, near Tel Aviv. Although the Samaritan religion is related to Judaism, it is also distinctly different. Their Torah scroll contains only the five books of Moses, and their shrine is on Mount Gerizim, which they believe to be where God created the world and where Abraham proved his loyalty to God by nearly sacrificing his son. In Kiryat Luza, you can visit the Samaritan Museum and then stroll to the site of the Samaritan Temple (destroyed in 128 BC). This rather surprising sight on Mount Gerizim is an exact replica of Andrea Palladio's Villa Capra in Vicenza. It's the work of Palestinian businessman Munib R Masri, who fell in love with Palladian architecture on a trip to Italy and set out to recreate it in his homeland. It's not open to the public, but if you're in the area, it's worthwhile swinging by so you can admire the sheer audacity of this bizarre piece of 16th-century architecture sitting amid the Palestinian hills from afar. Next door to Balata Refugee Camp are several important historic sites. Jacob's Well is traditionally believed to have been dug by Jacob and also believed to be the well at which Jesus met the woman of Samaria. Around AD 380, a cruciform church was built on the site, which in later centuries was destroyed and rebuilt several times. In 1885, the site was acquired by the Greek Orthodox who built the current St. Photina the Samaritan Church here over the well. A few hundred yards north is a building with a white dome known as Joseph's Tomb. Here, Joseph is said to have been buried by his father Jacob. Jenin has been an important town on the main route from Jerusalem for centuries. In the 13th century, the Mamelukes, fearing incursions by the Crusaders, destroyed the coastal towns and built Jenin up into a staging-point for caravans on the route between Damascus and Egypt. Until the early 1930s, the road from Jerusalem to Haifa and Galilee ran through Jenin, but with the development of Haifa as a port, and the construction of the coast road via Hadera, the importance of Jenin declined. Today, Jenin's old city, with its traditional bustling souk, is just the type of labyrinth you can get happily lost in and remains well off most tourists' radars. Jenin is also home to the excellent Freedom Theatre, which stages a program of plays and other performances throughout the year. The village of Sinjil, which takes its name from the Crusader Raymond de Saint-Gilles (Count of Toulouse) is six kilometers from the site of ancient Shiloh (Khirbet Seilun in Arabic; Shillo in Hebrew). In the early period of Israelite settlement, Shiloh was an important shrine, for this was where the Tabernacle containing the Ark of the Covenant stood for a hundred years from about 1175 BC. Excavations by Danish archaeologists from 1926 onwards brought to light a temple of the Canaanite period. Although highly important from a religious perspective, there isn't much to see at the site, and it's probably only of interest to the most enthusiastic history buff. In the 1st century BC, the Hasmonean king, Alexander Jannaeus, built the fortress of Alexandria here on the summit of Mount Sartaba. Destroyed by the Romans, it was later rebuilt by King Herod, and in 31 BC, served as a place of confinement for Herod's wife. It is a long, sweaty, steep climb up the hill to the remains of the fortress, but the effort is rewarded by magnificent views from the summit extending southwest to the Mount of Olives in Jerusalem. The site of Old Testament Shechem is two kilometers southeast of Nablus, on the saddle between Mounts Gerizim and Ebal. An important town in Canaanite times, thanks to its situation at the intersection of important roads running east-west and north-south, Shechem was associated with many events in the Old Testament. Abraham set up camp here on his journey from Mesopotamia to Canaan and erected the first altar. His grandson, Jacob, also pitched his tent outside the town after his return from Mesopotamia, bought land for a hundred pieces of money, and also erected an altar (Genesis 33,18-20). In the 17th century BC, the Hyksos built a fortress here. In the 13th century BC, Joshua had the remains of Joseph brought from Egypt and buried in the field, which his father Jacob had bought. Later, when Omri founded the new capital of Samaria, Shechem lost its importance and declined into a village until 350 BC, when the Samaritans made it their capital. The history of the town came to an end with its conquest by John Hyrcanus I in 128 BC. In AD 72, two years after the destruction of Jerusalem, Titus founded the settlement of Flavia Neapolis (the "new city") two kilometers northwest of the ruined town of Shechem. The town flourished, and in 244 was granted the status of a colony. At first mainly populated by pagan veterans (time-served Roman soldiers) and Samaritans, it soon acquired a Christian community, which produced the philosopher and martyr Justin Martyr, c. 100-165. In 521, the Samaritans killed the bishop and devastated the town's churches, whereupon Justinian had the rebels (except those who became converted to Christianity or managed to escape) executed or sold into slavery. In 636, the town of Neapolis was occupied by the Arabs and became known as Nablus. During the Crusader period, Queen Melisande, widow of King Fulk, fortified the town against her son Baldwin III, who, in 1152, excluded her from political life, but left her in possession of Nablus, where she founded a number of churches. The Crusader occupation of the town, however, was short-lived, and in 1187 it was recovered by the Arabs. In 1936, Nablus was the starting-point of a rebellion against the British Mandatory authorities. Jordan seized Nablus in 1948, but it was retaken by Israel in 1967.